Although I’ve written about a number of the Guild’s surviving buildings, a recent enquiry reminded me that I’ve not really written about the Guild Chapel itself. 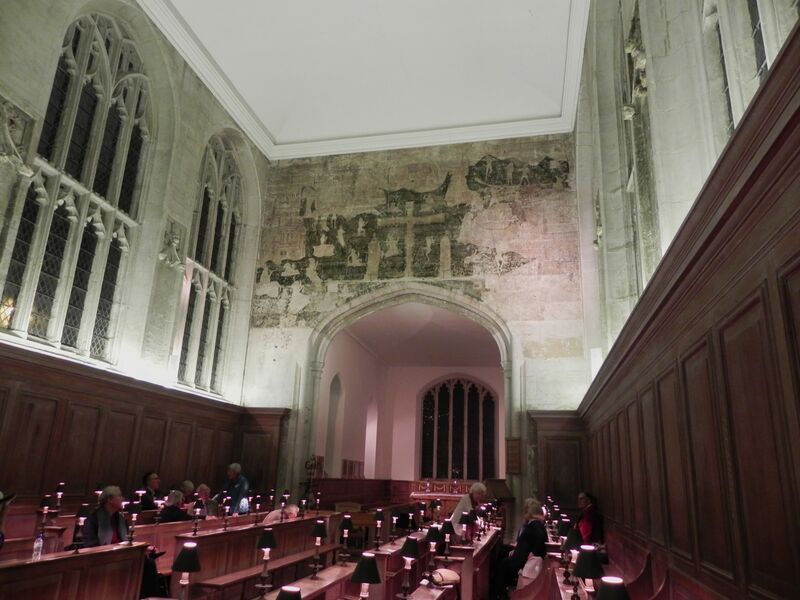 It has its Shakespeare connections: William’s father John supervised the whitewashing over of the paintings in the Chapel in around 1563, just before his son’s birth, and Shakespeare must have known the chapel well both from his school days and from the time when he lived just across the road in New Place. The Friends of the Guild Chapel now support this special building. There is known to have been a chapel on the site from 1269, when it would have offered religious services and masses for the dead relating to the Guild itself. Originally it seems to have been a small building, but the chancel was enlarged around 1450 and later in the century the main part of the building was rebuilt, more or less how it is now, paid for by Sir Hugh Clopton. In his will dated 1496 Clopton left money to the mason William Dowland, for the “belding and setting up of the Chapell of the holy Trinitie… and the Towre of a Steple to the same”. This extract from the will is reproduced in Kate Giles’ and Jonathan Clark’s chapter in The Guild and Guild Buildings of Shakespeare’s Stratford, edited by J R Mulryne. This recent book contains full information about the chapel’s history. The chapel is said to be “one of Europe’s most important surviving late-medieval Guild Chapels”. The wall paintings also date back to Clopton’s time. It’s not just the magnificent Doom over the chancel arch though: most of the walls of the church were covered in frescoes. 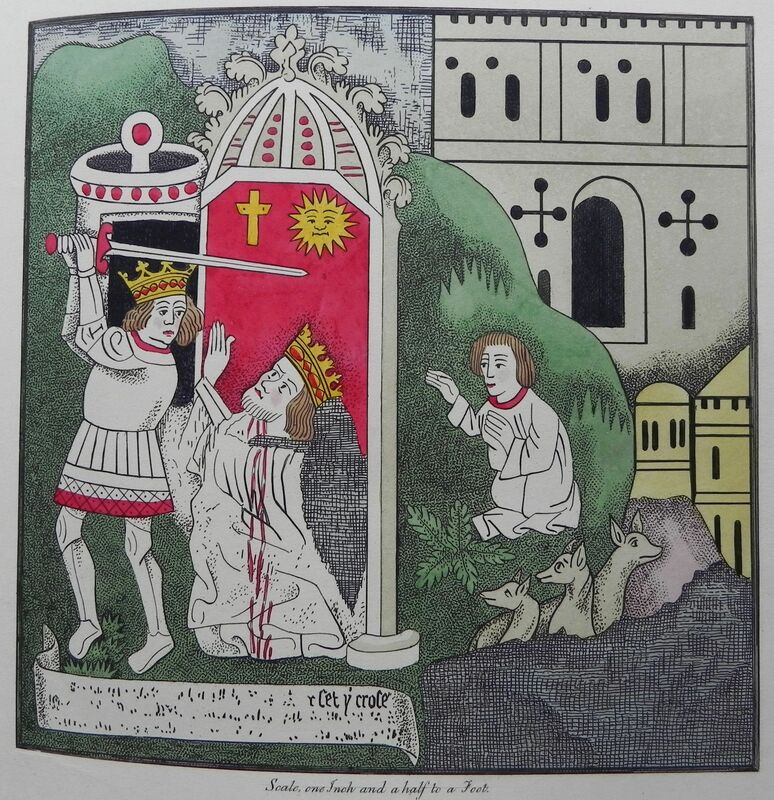 Subjects included St George and the Dragon, the martyrdom of Thomas a Beckett and, in the image reproduced, the much less-known story of the decapitation of the pagan King of Persia by the Christian King Heraclius. A number of determined antiquarians have been responsible for the documentation of the paintings, hidden by whitewash until they were rediscovered in 1804 during restoration work. Antiquarian Robert Wheler described them and Thomas Fisher quickly drew them. Fisher was later allowed to borrow hundreds of documents relating to the history of the Guild, some of which he copied meticulously. After his death in 1836 it was left to another antiquarian, John Gough Nichols, to publish them in a magnificent volume in 1838. Even though their importance was recognised, the images were subsequently destroyed or whitewashed over again. It fell to an expert on wall paintings, E W Tristram, to re-expose the Last Judgement images over the chancel arch in 1928. 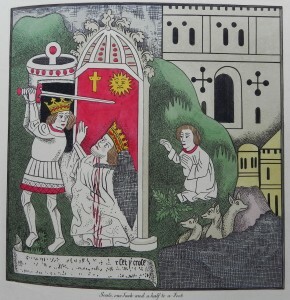 During the 1950s, though, Wilfrid Puddephat, the Art Master at King Edward School, examined the walls of the Chapel in minute detail, painstakingly recording everything he found, so that the other paintings that were once on the walls of the chancel and nave could be more accurately identified. Some which were in very poor repair have since been covered by wooden panels and others are tucked away behind hinged panels which are opened only occasionally. When first uncovered in 1804 Wheler noted the frescoes were “found to be nearly in a perfect state”. The Last Judgement or Doom remains the most visible of the decorations from Clopton’s time but even this is only a ghostly version of the original. 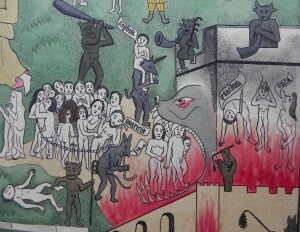 Fisher’s vibrant paintings give a tremendous impression with on the left side St Peter receiving the righteous at the gate of heaven while, as described by Nichols, “On the opposite side are the wicked being turned into hell, its entrance represented, as was usual, by the mouth of a devouring monster; and within its fiery gulph they are suffering various torments from the busy demons”. 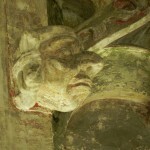 This website contains many images of the wall paintings as they are now. 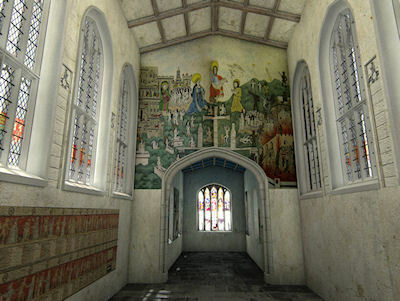 We can now also see a reconstruction of what the chapel might have looked like in its heyday courtesy of digital technology. This has been achieved by the Department of Archaeology at the University of York. The project reveals the Guild Chapel at Stratford-upon-Avon to be one of the finest examples of mercantile and guild patronage of the period, shedding important light on the patronage of ecclesiastical art on the eve of the Reformation, and revealing important connections between provincial guild architecture of Warwickshire and internationally significant schemes in London and Paris. It also provides a ground-breaking model of the ways in which digital heritage technologies can be harnessed not only by historical archaeology, but within the arts and humanities more widely. The work has been written up and published online in the open access journal Internet Archaeology*. This link is to a summary and this to the contents list. 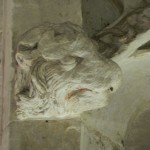 And you might like to look at this website which talks about the use of virtual models of historic churches and building conservation in general. The chapel is temporarily closed to allow a new organ to be fitted (this should be completed before the end of 2013), but on a recent evening visit I noticed some details, dating back to Hugh Clopton’s refurbishment, which rarely get a mention. These are the small stone sculptures high up on the walls of the nave. 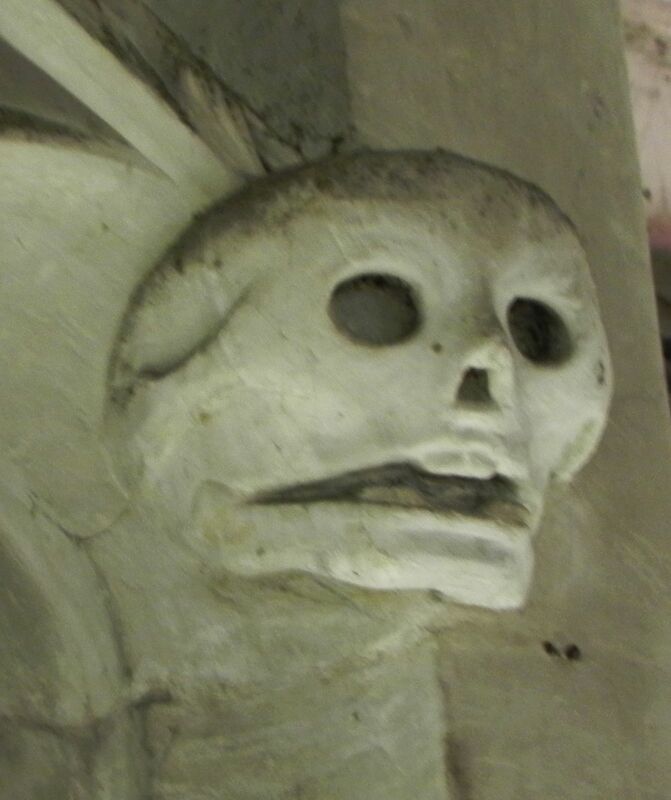 They are full of character, and traces of the original colours can still be seen on them: to go with the Doom, over on the north side is a skull, and on the south side are a whole series of images including a man with a large nose and an animal which it’s thought is a lion. It’s a lovely thought that these quirky characters have for over five hundred years been overseeing all the changes that have taken place in this ancient building. And next Wednesday at 12.30 a lecture will take place at Holy Trinity Church, Stratford, on the relationship between the Guild of the Holy Cross and Holy Trinity itself. The speaker will be Mairi Macdonald who knows more about this subject than anyone else. Admittance is free but this event is a fundraiser for the Friends of Holy Trinity Church. * Giles, K., Masinton, A., & Arnott, G. (2012). Visualising the Guild Chapel, Stratford-upon-Avon: digital models as research tools in buildings archaeology. Internet Archaeology, (32). This entry was posted in Legacy, Shakespeare's World, Stratford-upon-Avon and tagged Day of Judgement, Friends of the Guild Chapel, Guild Chapel, John Shakespeare, sculpture, wall paintings. Bookmark the permalink. Ah, Sir Hugh or not Sir Hugh that is the question?